I hate throwing food away, but however much I plan our meals, I always seem to end up with something going grotty in the fridge or cupboard. With more than usual about to go to waste this week, and lacking in treats due to a new strict dairy free diet (we suspect C might be cows milk intolerant, and dairy gives me migraines anyway), I decided to throw together some empty-the-cupboard pasties. In a kind of Cornish/Welsh hybrid the filling ended up being half a manky swede (all the manky bits chopped off of course! ), a pack of just-in-date mince beef, a leftover leek and a couple of very sprouty potatoes. This was all chopped up small and mixed up in a bowl with some mixed herbs and a liberal sprinkling of salt and pepper – don’t be shy with the seasoning! Pastry tastes better with real dairy in of course, but 14oz bread flour and 8oz of fat (a mix of Trex and block Stork), plus a bit of salt makes a perfectly satisfactory and dairy free substitute, whizzed up in the food processor and then with a little cold water added to make it stick together. This was all stuff we had in the cupboard / fridge anyway and was so quick that I can see us whipping up all manner of pastry based treats. Making up the pasties was the most time consuming bit and took me right back to my school days, rolling out the pastry a bit at a time to save over handling it, and cutting circles out round a cereal bowl. After a bit of trial and error I decided the best approach to filling them was to brush beaten egg around the edge first, pop a small mound of (uncooked) filling in the middle, stick one half of the pasty together, then pick up the pasty and top up the filling as much as I could through the open end. Once done it was just a case of sealing the whole thing together, cutting a few slots in the top of each and brushing over with beaten egg. Apparently you can freeze them at this stage as a ‘ready to bake’ treat, but they also freeze well once cooked, so I opted to bake them all at once. To strike a balance between nicely crisp pastry and cooked filling I started them off at 190c for about ten minutes, then dropped the temperature to about 150c for another 45 minutes or so. This seemed to work perfectly. 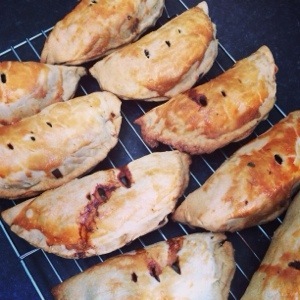 This recipe yielded about a dozen pasties, so half of them made their way into the freezer whilst the rest are there for a yummy homemade lunch. Beats the same old sandwiches and tastes beautiful warmed and topped with a bit of homemade tomato ketchup!